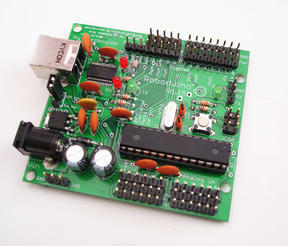 The system file for the Roboduino. This will assume an ATMega168 running at 16MHz. The board provides 6 ADC channels on IOPins C0...C5 and 14 digital pins connected on D0...D7 and B0...B5. A status LED is connected to digital pin 13 (B5) and is used by the library to flash any library error messages.